I cant disable Jumboframes in HP NIC Team interface, assembled from two NC326i interfaces in DL320G6 server. 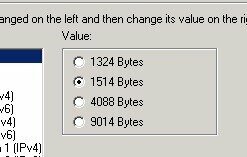 NCU give me a select from two values 4088 and 9014 bytes, therefore i cant select 1514 bytes = disable JumboFrames. For example server DL380G7 with NC382i interfaces, have a four values of JumboFrames 1324, 1514, 4088, 9014 bytes. What can i do ? My interfaces connected to 100mb ports in cisco 3750, it does not support jumbo ! If the issue is not fixed after following the advisory, log a support call with HP. NIC settins not have LSO parameter ! then the Jumbo frames had the option of 1514. This is an issue that is very hard to troubleshoot if you're using an untattend method to deploy servers. I use the Windows Deployment Workbench to create Win 2008 images. I use a simple script to install all HP components including the NIC drivers and HP NIC config utility. There is no indication of conflict until after the build completes. My deployment engineers have been complaining for more than a month that all their DL320 G6's would stop Active Directory replication for seemingly no reason until we found out about the Jumbo Frame setting being enabled just because the NIC driver and HP NIC Configuration Utility versions were conflicting. What made troubshooting even harder was even after upgrading to the latest driver and NIC utility tool, the AD replication issue was still persisting. That was because the Jumbo Frame setting would remain enabled even after the driver update. You have to go in the NIC Utility tool and manually disable the Jumbo Frame setting.